There was also a bit of scattered wind damage in parts of Autauga and Elmore counties earlier. The sky will clear tonight, and we project a low in the 30-35 degree range early tomorrow. REST OF THE WEEK: Tomorrow will be a brighter day, with sunshine returning in full force. 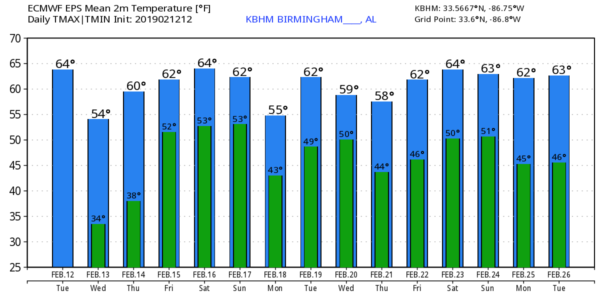 The high will be in the mid to upper 50s, right at seasonal averages for mid-February. Thursday will be dry as well… the sky will be partly sunny with a high in the mid 60s. A cold front will approach from the north Friday; the day will be mostly cloudy with a chance of showers. There won’t be much upper support, and moisture will be pretty limited, so rain amounts on Friday should be on the light side. The day will be mid with a high in the upper 60s. THE ALABAMA WEEKEND: The front will stall out near the Tennessee state line Friday night, meaning rather unsettled weather for Alabama over the weekend. The sky will be mostly cloudy Saturday and Sunday, and we will deal with occasional showers both days. But, it won’t rain all weekend, and temperatures will be pleasant on Saturday with a high between 67 and 70 degrees. Sunday will be a bit cooler, with a high not too far from 60. Rain amounts over the weekend should be around 1/2 inch. NEXT WEEK: We will need to maintain some risk of rain during the first half of the week. For now, it looks like the most widespread rain will come Monday night into Tuesday, but getting the timing correct in this very active wave pattern is a big challenge. Some rain could return late in the week as well… temperatures will be fairly pleasant during the week with highs in the 60s on many days. See the Weather Xtreme video for maps, graphics, and more details. ON THIS DATE IN 1958: Snow blanketed northern Florida, with Tallahassee reporting a record 2.8 inches. A ship in the Gulf of Mexico, 25 miles south of Fort Morgan, reported zero visibility in heavy snow on the afternoon of the 12th.